This registration form is for new students wanting to take private voice lessons. Lessons can be 1 hour or 90 minutes, and be focused on voice, acting, and/or songwriting. Many students take lessons and like to explore all areas of music and acting depending on their specific interests and goals. Lessons are $40 an hour and payment is due per lesson, or pay-in-advance for multiple lessons. To request a lesson, simply fill out the form below and hit "Register!". You will receive an email from me within 24 hours to give you available times for lessons! I love Birthdays! If you're willing to share your Birthday with me, I will happily have a treat for you on the week of your lesson. If the student has taken lessons for anything music, theater or dance related I would love to know about it! You can list out any previous experience in the comment box below. 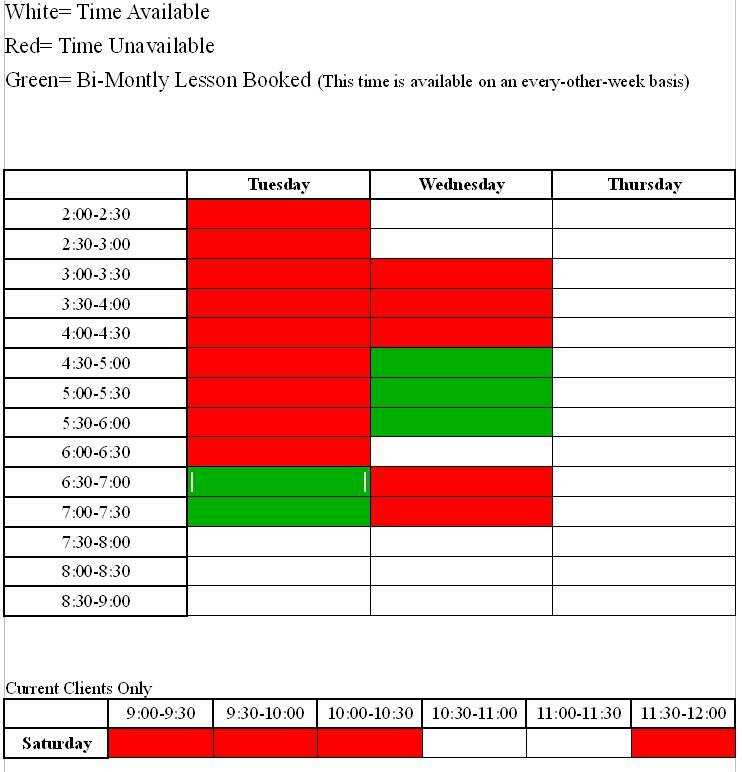 Please choose one or more day you are available for lessons and I will email you shortly to give you available times for the day(s) selected. You do not need to have any specific plans in mind at this point, but sometimes having a goal, even a small one, helps me to point our lessons in the right direction for you! Please feel free to share any additional info you'd like me to know here. You may also add certain times of the day that work best for your lesson and I will do my best to accommodate your request. Teen's acting class will practice interpreting scripts and the creation of more complex characters. Students will also try their hand at creating dramatic, comedic and/or improvisational scenes to share with their families on the last day of class. Cost of tuition is $75, and due the first day of class. 12 13 14 15 16 17 18 Out of age range, but understand the nature of this class.